Goal Seek Analysis: How to find the result you want? Use the Goal Seek analysis if you want to find out what input value a formula cell needs in order to get a certain result. For the sake of illustration (this example is trivial but good to understand the concept of Goal Seek), let’s imagine you have built a model and your Profits are USD 30M. You can’t reduce the rent but can decide to hire fewer people in order to increase the profits. So you ask Goal Seek: what should the Salaries be to meet a profit goal of USD 80M? 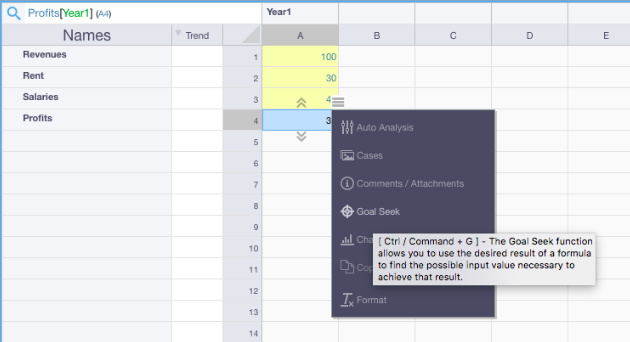 Right click on the profit cell and select Goal Seek (or use the shortcut Ctrl / Command + G). In the Goal Seek panel, set the goal for the formula cell: you want Profits to be 80. Select the input cell for which you want to know the value that will get us the result we want in the formula cell: type Salaries[Year_1] in the input field or use the magnifying lens to select the cell from the spreadsheet. Click on Find Goal and you will know that Salaries would have to be -10 to achieve your Profits goal, hence you cannot achieve this goal even by hiring nobody. Intuitive financial software built to simplify the way you manage your business.